When German media examined the NSU verdict in July 2018, another trial came to an end, which went almost unobserved. This related to the unsuccessful attempt to prosecute a bomb attack in Düsseldorf as far as the year 2000. The defendant, a 52 year old right-wing extremist named Ralf S., was acquitted. He was alleged to have committed this attack for anti-Semitic and racist reasons. On July 27, 2000, a pipe bomb exploded at the commuter rail station “Wehrhahn” in Düsseldorf, the capital city of North Rhine-Westphalia. The bomb injured ten men and women, some severely. One woman lost her unborn child; she and her husband, both severely wounded, needed to stay in hospital for almost a year. All victims were immigrants from the former CIS states, and six of them were Jewish. At the moment the bomb exploded they had just left a German language class nearby; as usual, they were passing the station on their way back. After the bombing, German society was shocked, especially since possible radical right motives for the attack were mooted by politicians and the media. After a second incident in Düsseldorf in October 2000, an arson attack on a synagogue (as it turned out later, two young men with Arabic backgrounds were the perpetrators), the then-Federal Chancellor, Gerhard Schröder, called for an “uprising of all decent people” against a new wave of anti-Semitism. In the aftermath, the Social Democratic/Green coalition government decided to fund new federal programs against radical right extremism and racism, through which numerous NGO’s and projects are financed to this day. Since 2001, the government has spent several hundred million Euros for this purpose. The criminal investigations concerning the 27 July bomb attack were cumbersome. After a year of inquiry, the police task force that investigated the attack had achieved no results. The special commission quickly shrunk from 80 to only two officers. The main suspect, Ralf S., who was arrested and questioned after the bombing, had to be released. He was known to be a radical right extremist and gun-fanatic. At the time of the attack, he ran a military surplus store near the crime scene. The investigators tracked down numerous other hints, even though they led nowhere. It was clear, however, that the explosive had been constructed very professionally and that it was detonated by a remote-controlled device. Despite these leads, in 2009 the case was closed without charges or indictments. After the murders and bomb attacks committed by the radical right terrorist group NSU (“National Socialist Underground”) had come to light in 2011, the investigations into the 27 July bombing were revived, with possible links to the NSU investigated. However, the investigators found no connection. A breakthrough came in 2014, when Ralf S., who was serving a short prison term, bragged to a fellow inmate about having carried out the attack. After two years of investigations and surveillance, he was arrested in 2017 and brought to court almost a year later. The following trial was based on circumstantial evidence that incriminated the defendant despite his protestations of innocence. The prosecutor introduced several wiretapped phone calls in which Ralf S. admitted the attack. Additionally, several witnesses were called who claimed to see the man nearby the crime scene shortly after the attack. 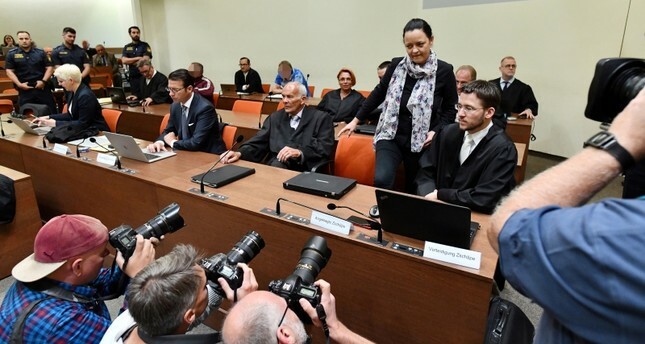 Given the high profile of the case, it is surprising that the victims of the bombing played almost no role in German media coverage – even though some appeared in court as witnesses or as joint plaintiffs. Some of the victims have since moved away from the area, with a few even returning back to their countries of origin. The injuries and the trauma the attack have caused has shattered their lives; some victims had to give up the plans they had made for their new life in Germany, or have even been unfit to work since. At the former crime scene, incidentally, nothing recalls this devastating attack. Even after 18 years, no memorial stone or commemorative plaque has been installed. Although the prosecutor requested a life sentence for Ralf S. in his closing statement, the defendant’s acquittal on 31 July 2018 came as no surprise. In May 2018, the court had released the defendant from pre-trial detention due to a lack of urgent concern. Furthermore, the chief judge did not accord credibility to important witnesses for the prosecution, making a conviction much less likely. However, the chief judge acknowledged that the racist mindset of the defendant, especially his hatred against immigrants and Jews and his knowledge about the quarter around the Wehrhahn station, made him suspicious. Nevertheless, this evidence would not suffice for a conviction. It is unclear yet how the handling of this bomb attack will play out. Perhaps the Federal Supreme Court will address the verdict since the prosecutor has appealed. But in all likelihood, with this verdict the case has been closed for good. However, the open discord between the prosecutor and the chief judge left both joint plaintiffs and the local Jewish community bewildered. The expectation of the victims’ representatives that the court would solve the case was not answered. The divided public opinions about the case – “benefit of the doubt” vs. “the evidence suffices for a verdict” – also depicts how fractured the German public still is while dealing with possible or actual right-wing terrorist attacks. Dr. Barbara Manthe is a Senior Fellow at CARR, and a specialist in Right-wing terrorism in Germany since 1945. © Barbara Manthe. Views expressed on this website are individual contributors’ and do not necessarily reflect that of the Centre for Analysis of the Radical Right (CARR). We are pleased to share previously unpublished materials with the community under creative commons license 4.0 (Attribution-NoDerivatives).